The ceruloplasmin test measures the ceruloplasmin blood level. A ceruloplasmin blood test measures the ceruloplasmin blood level. Why is a ceruloplasmin blood test important? The ceruloplasmin lab test helps screen for copper disorders and Wilson's disease. This Ceruloplasmin Test is a blood test. The ceruloplasmin test, also known as a ceruloplasmin lab test and a ceruloplasmin blood test, measures the ceruloplasmin blood level. Ceruloplasmin is a protein that has the primary role and function of carrying copper - an important element - in the blood and the additional responsibility of helping to metabolize iron. Made in the liver, ceruloplasmin levels are correlated with liver function which is why it is sometimes ordered with liver function tests. Ceruloplasmin is a major store of the body's copper supply and ceruloplasmin levels are often tied to copper levels. Low ceruloplasmin levels can be caused by rare diseases (e.g. Wilson disease), kidney and liver disorders, genetic mutations and low copper blood levels from decreased intake or impaired absorption. High ceruloplasmin levels can be caused by inflammatory states like pregnancy and cancer, excessive copper levels, cancer and specific types of neurological illnesses. The ceruloplasmin test is often ordered with the copper test and other mineral tests. To get a ceruloplasmin test near you, order online and get your blood drawn at the selected Quest Diagnostics lab. Once the ceruloplasmin lab report is ready, it will be available for download. No fasting is recommended before the ceruloplasmin lab test. 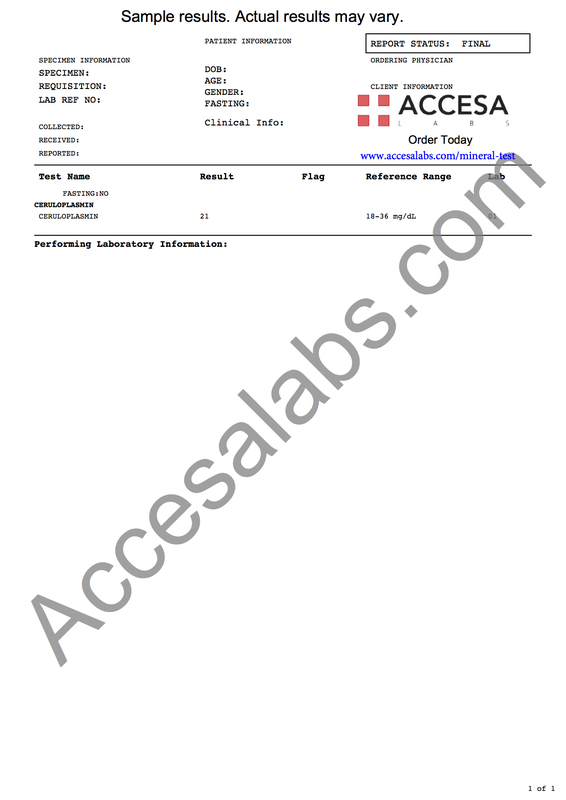 As can be seen on the sample ceruloplasmin lab report above, the ceruloplasmin blood level is reported as a number and can be compared to the reference range provided by the lab. Ceruloplasmin Test at Guaranteed Prices.